Discussion in 'Shows & Conventions' started by darthskellington, Sep 7, 2012. I figured I'd better talk about this con, which was back on August 18-19, before I move on to CVI. We were swamped with a marathon of work, cons, weddings, and other activity this past month, so it all seems like a bit of a blur. 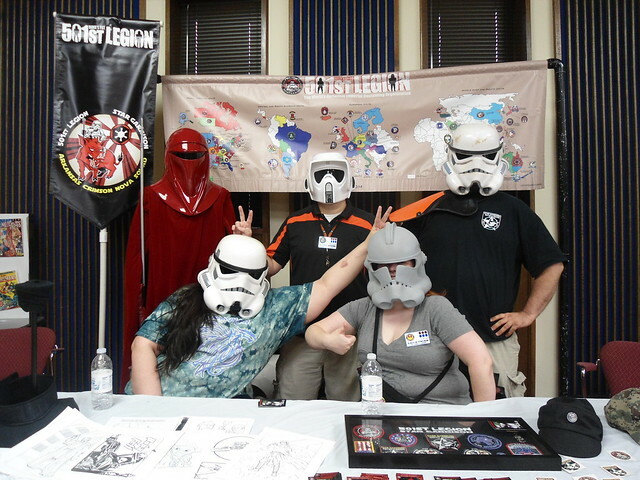 The Legion got a request for us to appear at the second annual Ark-La-Tex Comic Con, held in Texarkana, TX. Erica and I both went, and brought along a few friends for both days. 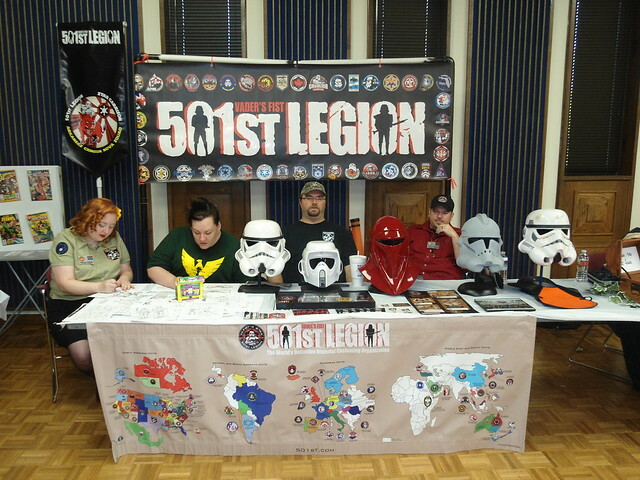 The con was kind enough to give us a table to promote the 501st, so we brought along some banners, flyers, and random costume bits and pieces. We also had coloring book pages for the kids, which seemed to be pretty popular. 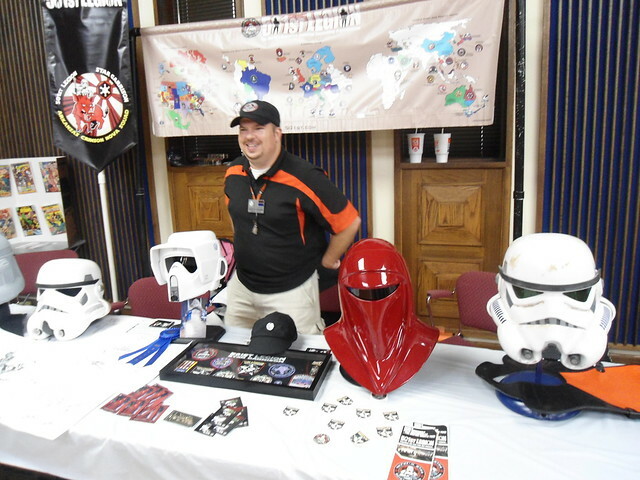 This was a small con, held on a college campus, but it had a nice turnout and good variety of dealers, guests, etc. One could find comics, toys, costuming, and gaming. 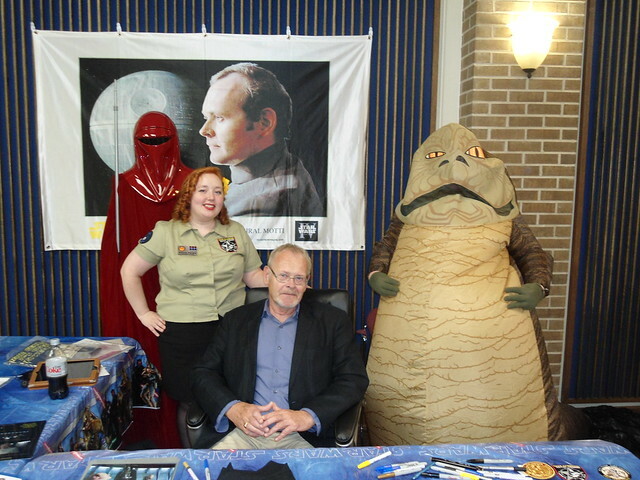 The guest was none other than Richard LeParmentier, better known to us Star Wars fans as Admiral Motti. 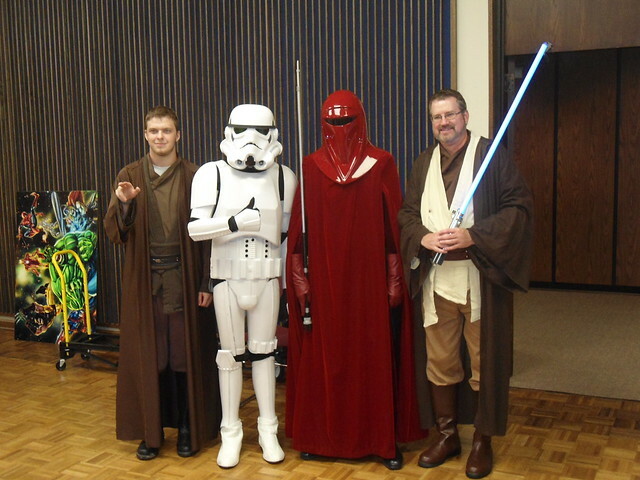 The first day I wore my Royal Guard, Erica dressed as Princess Leia, and our friend Scott wore his Biker Scout costume. Ashley tried out our Rubies Jabba the Hutt costume, and even won the costume contest. 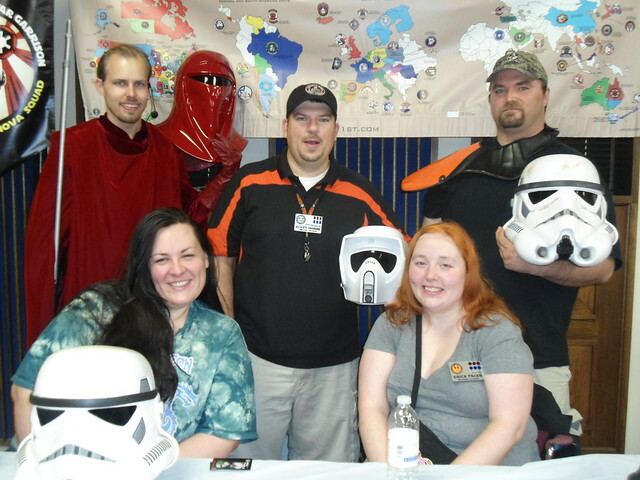 Meanwhile Bobby manned the table with his Sandtrooper helmet and pauldron. After a long day of costuming and discussing costumes with people, we ended with a meal at Waffle House. In addition to eating copious amounts of hash browns, we discovered Scott has an obsession with collecting Holiday Special memorabilia. Sunday we did more table-manning, costume discussing, and shopping. We talked to Richard several times and Erica got our picture with him. As the con was winding down, we ended up going out to dinner with Richard, and had a good time. He talked about working on Superman II, and some of the various shows and movies he liked, disliked, etc. 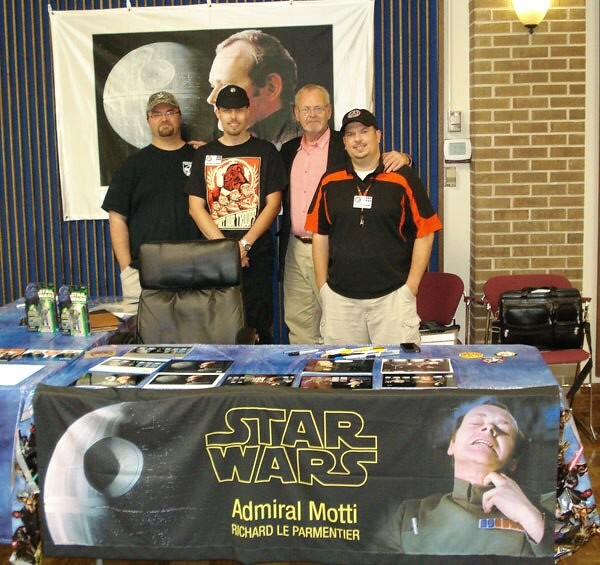 Overall, it turned out to be a fun weekend, and the dinner with Admiral Motti was a pleasant surprise. The convention is to be held in a new convention center next year, which should allow it room to grow. I look forward to seeing this one expand in the future. If you live near the Texarkana area, it's worth checking out. Here's a bunch of nerds at the con. I think they like Star Trek or something. Some great costumes. Perhaps they will join the the 501st and Rebel Legions. 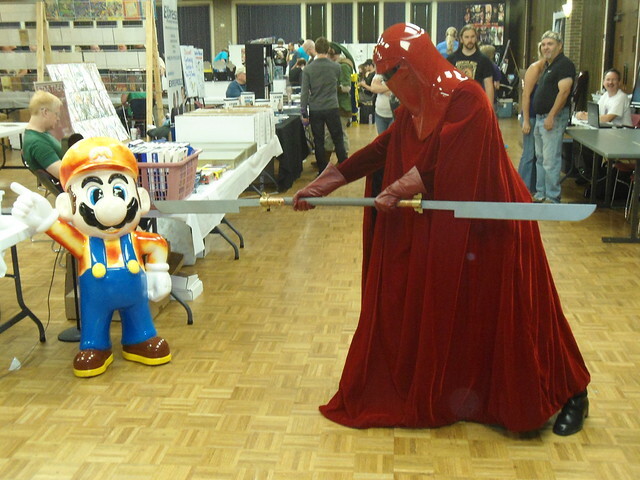 Take that disco dancing Mario! 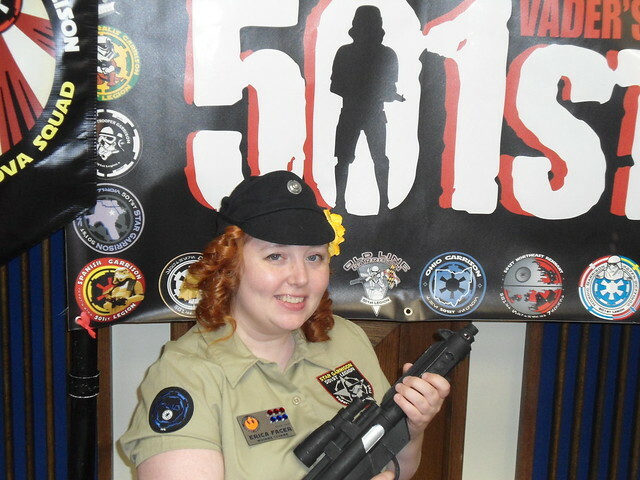 Erica in her RSO (Republic Service Organization) outfit. With Imperial cap just for fun. And everyone relaxing after we finally got both banners hung. A parting shot of the con. Looking forward to next year! 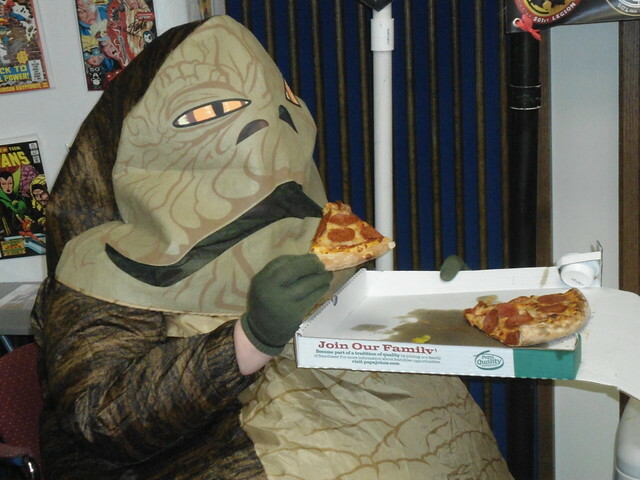 That picture of Jabba eating pizza is hilarious! And that's cool that you got to have dinner with Admiral Motti.